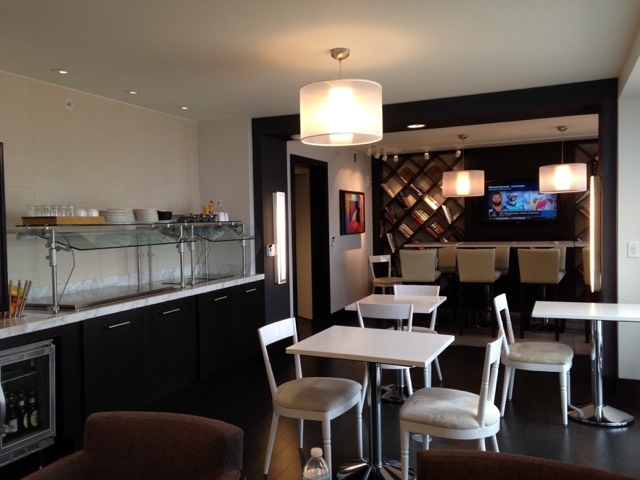 Last weekend, The Kid and I lived the “Suite Life” in Columbus, Ohio. We lounged around, enjoyed a visit to Gallerie and took a modern art tour, had a ball at a wedding reception, and I made some delicious executive decisions. 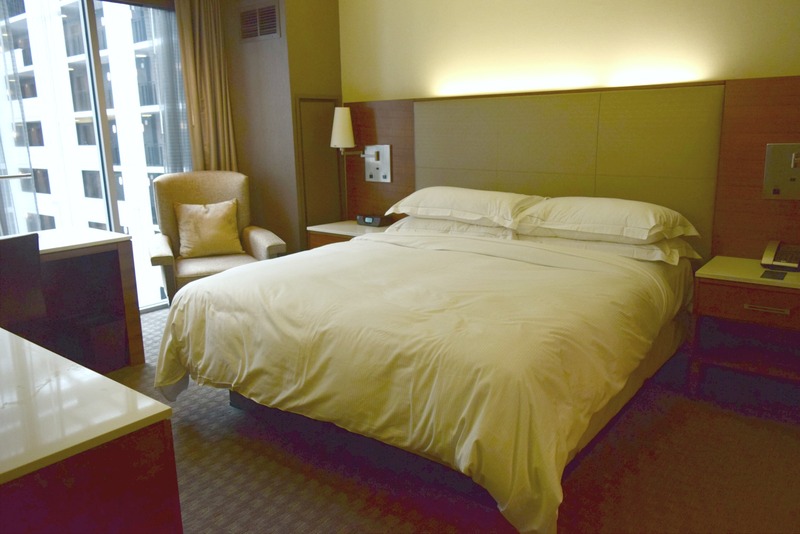 While this may sound ambitious, it all happened under one roof- Hilton Columbus Downtown. The view from our suite was unlike one I’ve ever seen before: it looked down on Gallerie, the in-house upscale restaurant. With wall-to-wall windows we could see the inner areas of the hotel and it looked like a mini city. 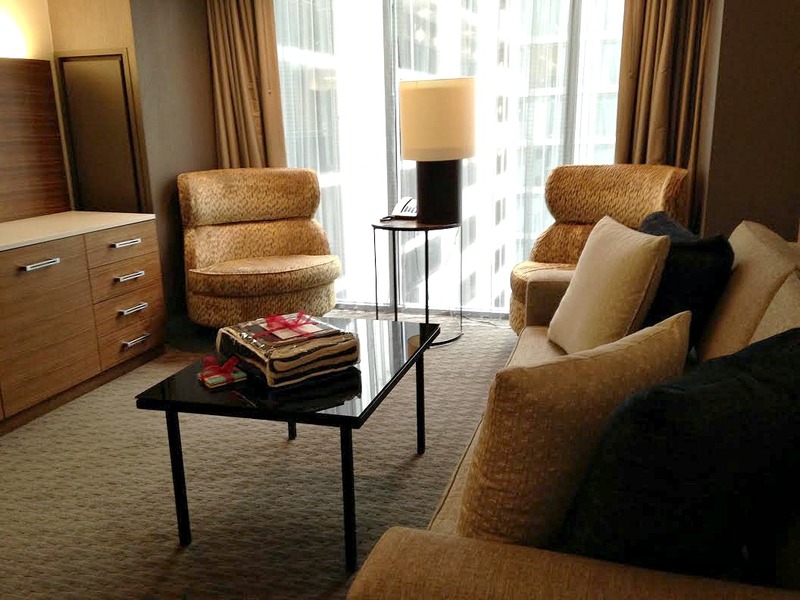 If there’s one thing I adore about upscale hotels is their executive lounge area. Yes, it’s an upcharge, but when you have parents and kids and are planning on spending money on meals, it’s very worthwhile. The Hilton Columbus Downtown is definitely one of those lounges. With Executive Lounge privileges comes a full breakfast, drinks and snacks throughout the day, and hor d’oeuvers from 5-7pm each night. 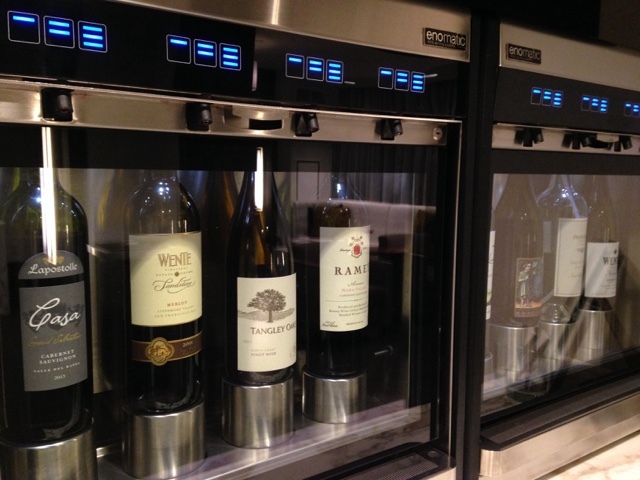 Wine offerings at night for folks over 21 and the pours are reasonably priced compared to a big city bar. You don’t even have to leave the property and the lounge is very spacious and comfy. 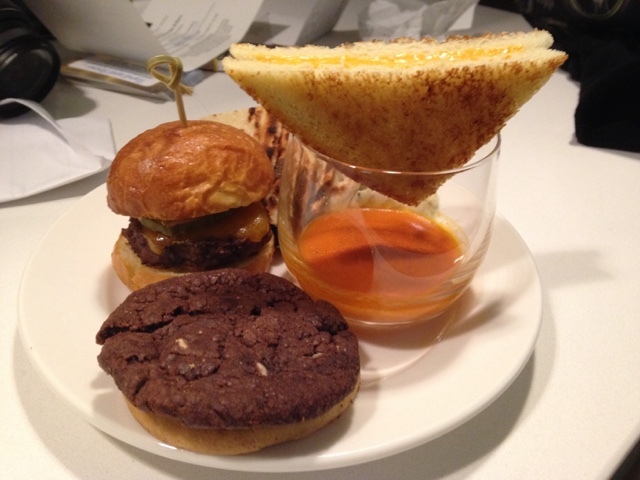 We enjoyed mini cheeseburgers, grilled cheese and tomato soup, and even freshly baked cookies. Breakfast each morning was really good as well. The Kid loves mixing orange and cranberry juices together and I have to agree- it’s delicious. Gallerie Bar & Bistro is a restaurant that allowed me to walk away with a feeling of inspiration. The restaurant’s Chef Glover is famous for taking common dishes and putting a unique spin on their ingredients and presentation. Gruyère Gougères was our appetizer. 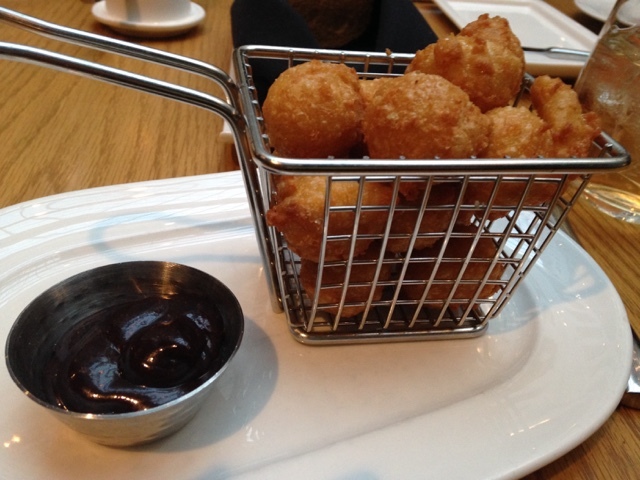 The fried Gruyère cheese puffs were so delicate and light and the blackberry ketchup for dipping was a fun spin. The Ohio Burger- Chef Glover’s masterpiece of Angus beef, house-made espresso-rubbed bacon, Gruyère cheese, blackberry ketchup, smoked onion dijonnaise, tomato, and a house-made bacon infused brioche bun. Shrimp and Grits was The Kid’s entree choice. As we’ve traveled down south frequently these past couple of years, she knows all about tasty southern-style dishes and loved this one. 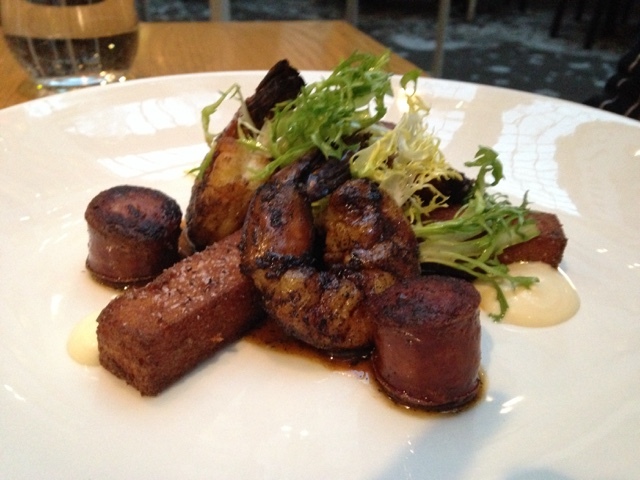 Prawns, Andouille sausage, crispy polenta, lemon aioli, a shrimp reduction, and frisee completed the dish. What did a 14 year-old think of it? Delicious. Last September, Chef Glover (along with Pastry Chef Devon Morgan) took over the James Beard House kitchen and presented this dessert, Ohio Sweet Corn Souffle, as the grand finale of a six course meal.Our waiter told us ahead of time that this was not a traditional, super-sweet dessert and I was instantly intrigued. He was right; the dish had just enough sweetness with the Mascarpone-Honey Sabayone, roasted grapes, and Brandy snap (for that bit of crunch that everyone loves). 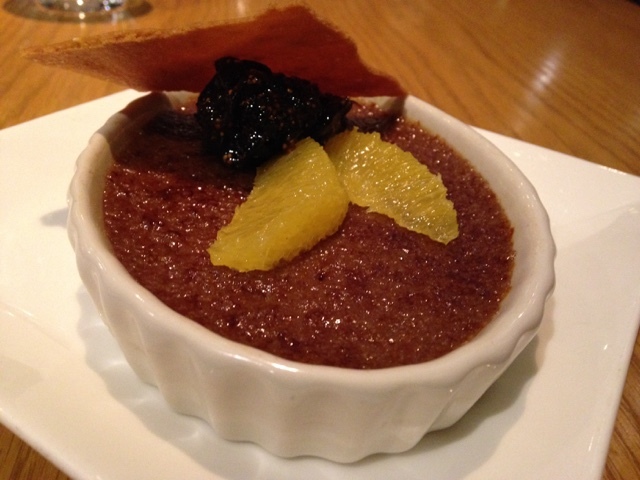 On the other hand, the Milk Chocolate Brulée was much sweeter, but the rich texture and crunchy top was perfection. 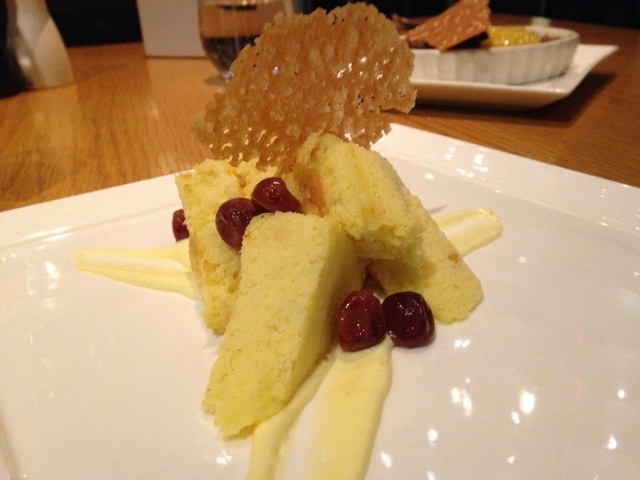 Fig compote, orange slices, and a sesame tuille gave the dish a fun spin. Columbus is booming with art and I’m happy to write that The Kid loves both modern art and the masters. 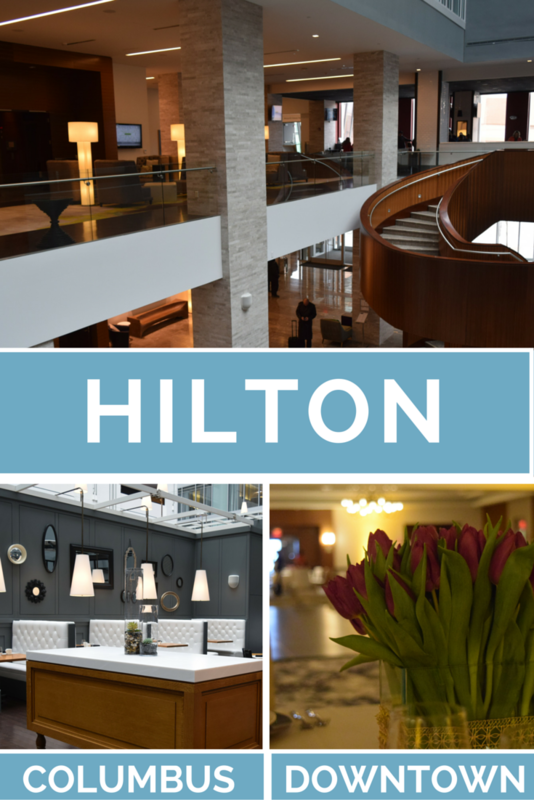 At Hilton Columbus Downtown, the property has 225 pieces from local artists and have found a way to tap that creative talent to make the hotel a fun lesson in art- and a great way for kids to learn about it. The lobby area is host to a monthly changing exhibit. This month’s theme, #MobilePhoneNow, came straight from the Columbus Museum of Art. 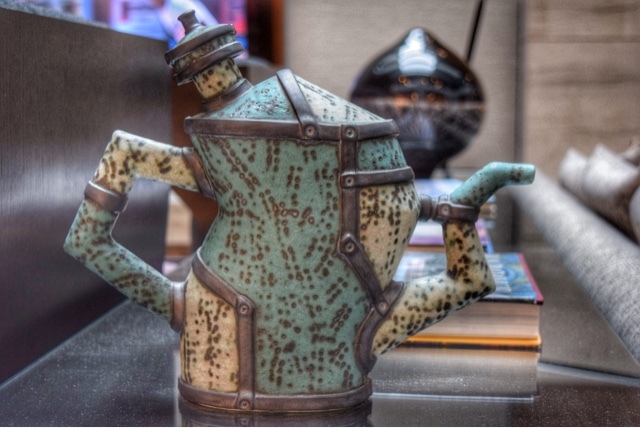 One of my favorite pieces in the lobby collection, Teapot II by Scott Dooley, has an extraordinary take on a common household item. Of course, there’s so many more pieces throughout the hotel- and even above the beds. We were so lucky to experience the Wedding Open House the weekend we visited. 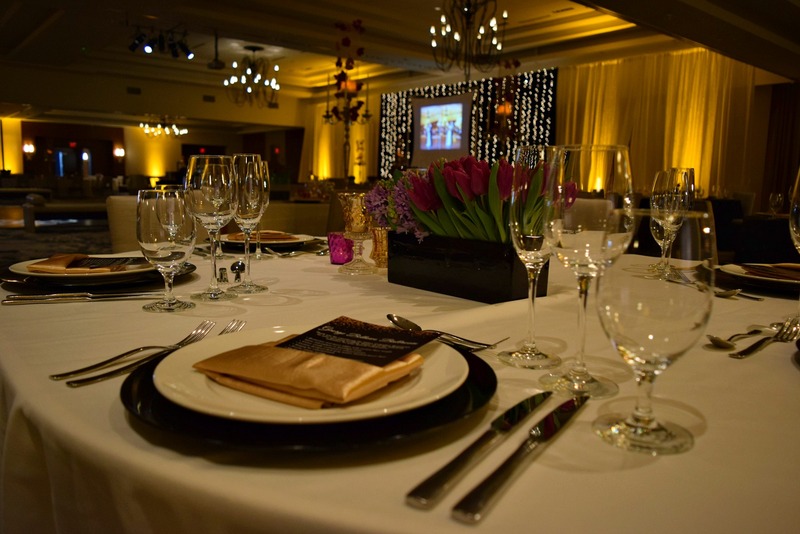 I always tell Mr. Locke that I could get married every month because I love everything about weddings, but at Hilton they do all of the planning. The Kid and I walked around the ballroom and dreamed. 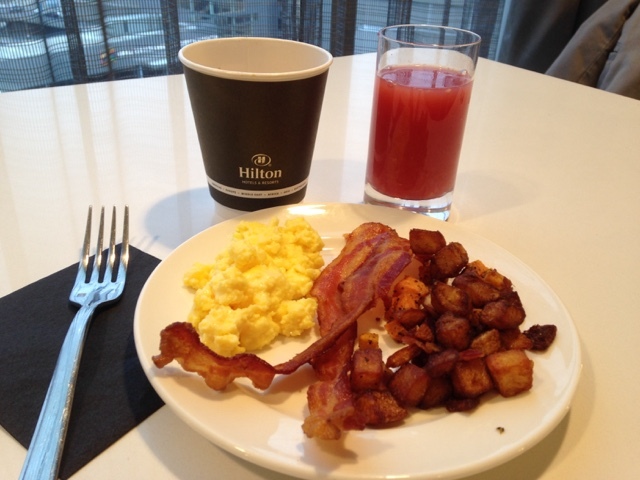 For a chilly January weekend, we made the right decision to visit Hilton Columbus Downtown. The staff was so helpful and kind, our accommodations homey, and the general splendor of the property is already making me wish I was taking another art tour. Disclosure: I was hosted by Hilton Columbus Downtown to give you fine folks the scoop on what makes the property so worth a visit. I was not asked to state a particular point of view and all opinions are my own!